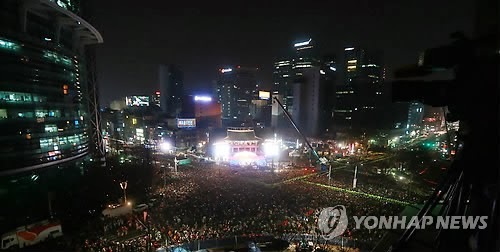 After protests drew hundreds of thousands out to rally against the Park Geun Hye administration, National Intelligence Service (NIS) election interference and railway privatization protests, downtown Seoul drew crowds last night for the annual New Year's Eve celebration near Bosingkak for the ringing of the bell at midnight. Although about 100,000 people came out for the celebration, the mood in Seoul reflected the disenchantment expressed in the "How are you doing" poster campaigns that have been posted on campuses across the nation. I have attended this celebration at Bosingkak four times and usually it is a quite festival affair. Usually we enjoy upbeat performances and the crowd is quite excited. Each year a rendition of Arirang swells as the crowd sings along. Popular songs from the past year elicit cheers and crowd participation. 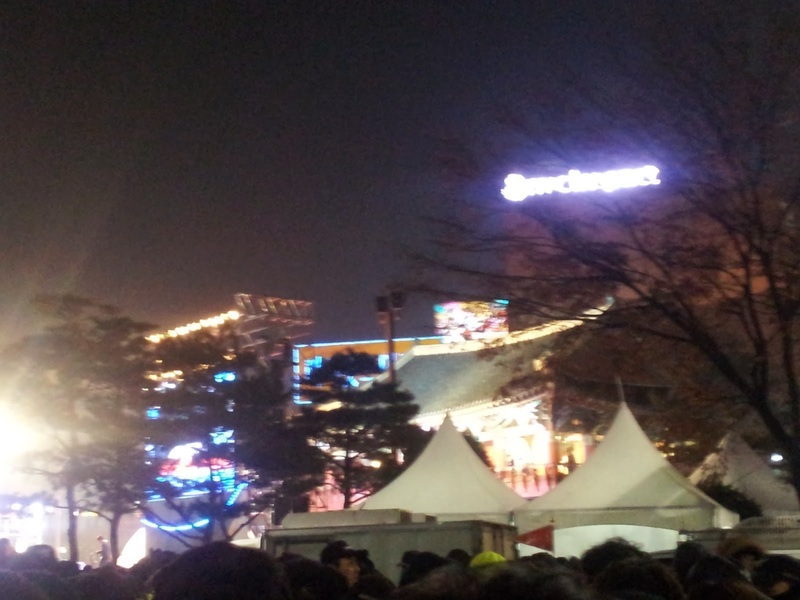 Fireworks and cheering crowds usher in the New Year and you can barely hear the ringing of the bell over the crowd. Ordinarily the fireworks light up the sky and members of the crowd shoot off many Roman Candles for added color. Along the stream near Bosinkak you will usually find abundant decorations and light displays, but last night there was only one small grouping of a lit tree. I suspect that decorating for the holidays was a quite low priority this year amidst protests and recession. But it wasn't only the government side of the celebration that seemed... less... than in previous years, it was also the citizens, who despite coming out, were rather quiet and uninspired to ring in the new year. Police crowd control forces in their their yellow jackets and holding red flags were stationed not only at the perimeter of the crowd, but even prominently distributed throughout the crowd this year. Last night, the music selection and performances were quite subdued. Slow and almost sad ballads were the predominant performances, in contrast to the flashy uptempo dance performances in past years. Even when performers on stage tried to elicit crowd participation, asking the 100,000 attendees to sing the chorus or join in some some call and response singing, the crowd was rather quiet. The event seemed either thrown together at the last minute, or intentionally down tempo. Even the b-boy performance was alongside a mellow rendition of Arirrang. As the clock struck midnight, we counted down from 20 and after a brief cheer, a single spray of silver confetti showered the surprisingly quiet crowd. I could distinctly hear the bell, for once. 흑형이란? What is meant by Black (Big) Brother?